President Rodrigo Duterte launched the “Philippine Drug War” or Oplan Double Barrel (or Operation Double Barrel), in reference to two barangay-government and Philippine National Police (PNP)-coordinated campaigns, is aimed at “the neutralization [ie. killing] of illegal drug personalities nationwide”. 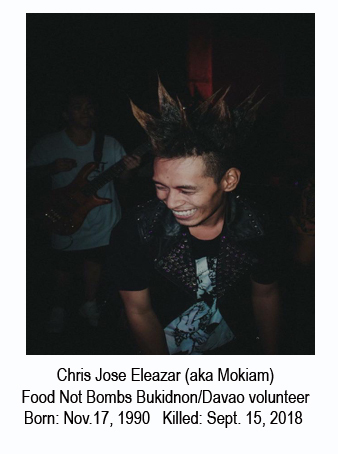 Bukidnon/Davao FNB volunteers’ Chris Jose Eleazar (aka Mokiam) and Jan Ray Patindol (aka Pating) were tortured and killed during a raid on the home of a Food Not Bombs volunteer on September 15, 2018. Their bodies were covered with cigarette burns and bruises. The police claim that they “fought back”. Friends said the two did not resist and that when they saw the dead bodies there were indications that the two young men were tortured before being killed. 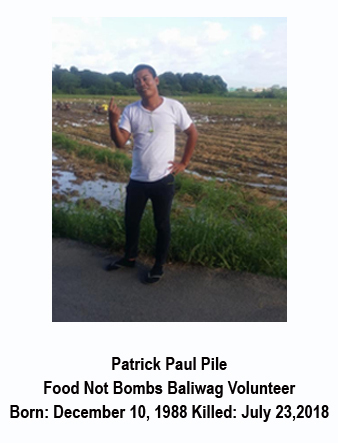 Two Food Not Bombs Baliwag Volunteers, Jessie Villanueva De Guzman and Patrick Paul Pile were killed in July 2018. 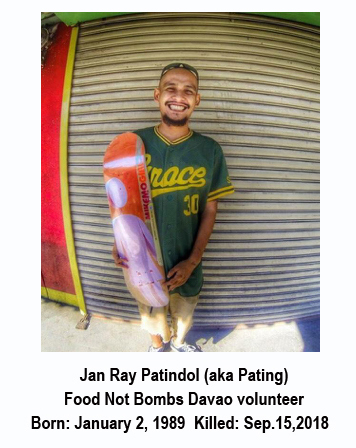 They were very active members of Food Not Bombs Baliwag who made their living as tricycle drivers at night. 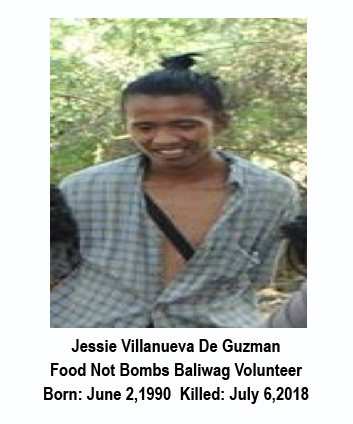 Jessie was killed by the police in Baliwag, Bulacan. A week after Jessie was killed Patrick by a tricycle passenger agreed to pay for a ride to San Rafael, Bulacan, Patrick drove him all the way to the destination where a group of police were waiting. Patrick was killed by one gun shot to the back. Patrick is not the only tricycle driver to experience this pattern of killings. conditions he is enduring. His supporters have set up a gofundme site to raise money for a lawyer. They would like to ensure that Marco gets a fair trial in what they know first hand is a corrupt society. A lawyer has agreed to represent Marco and the local people from Bantayan have managed to raise one-third of his costs between them. So far there is no hard evidence that they were targeted because of their work with Food Not Bombs. A global protest against President Rodrigo Duterte’s government and his murderous “Philippine Drug War” is being planned for October 2018. Food Not Bombs will announce of the details this week.